Cast members Esme Williams, Gabby Fell, Amberstarr Gambrell and Christopher McIlrath. NPA/HSU – The Young Actors Guild of Northcoast Preparatory and Performing Arts Academy presents The Odyssey, a musical adaptation of Homer’s classic, adapted and directed by Gretha Omey Stenger, at the Studio Theatre, (also known as the “Black Box”), at Humboldt State University Wednesday, Dec. 7 through Saturday, Dec. 10. Doors open at 7 p.m.; performances begin at 7:30 p.m., with a 1:30 p.m. matinee Dec. 10. Admission is $10 general, $8 students; special Saturday matinee prices: $6 general, $4 students. Reservations: brownpapertickets.com or call Michele Holper at (707) 445-2355. Telemachus, with the help of a powerful advocate, the goddess Athena, sets off on a journey to find news of his long lost father, the hero Odysseus. Meanwhile, suitors to his mother Penelope take over his house and threaten to kill him if he interferes in their sinister plans. Odysseus, after almost 20 years away from home, relives his many misadventures on the seas as he relates them in the court of King Alcinous. After undergoing the final tests of the gods, Odysseus arrives safely in Ithaca and reunites with his son Telemachus. The goddess Athena joins the father-and-son team to defeat the suitors, rescue Penelope and restore peace in the land. The imaginative staging of this timeless classic is sure to engage the audience with scenic elements inspired by Japanese Noh Theatre and toe-tapping muscial numbers taken from some of the greatest hits on Broadway. 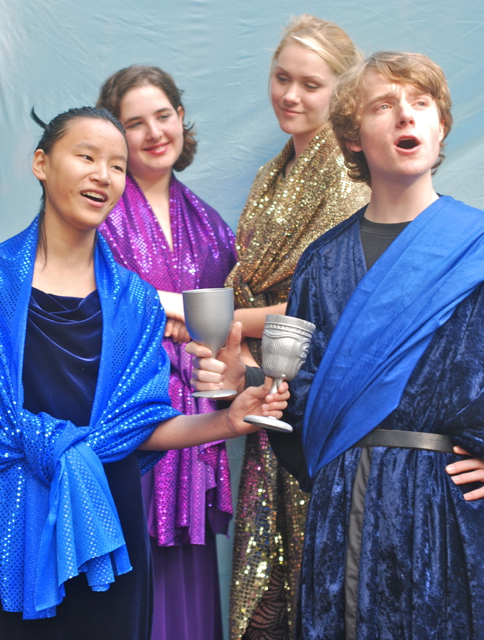 NPA’s production of The Odyssey explores themes of love, loyalty, power and perseverance. This entry was posted on Tuesday, December 6th, 2011 at 9:50 am	and is filed under Scene, Calendar. You can follow any responses to this entry through the RSS 2.0 feed.